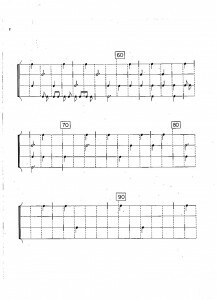 This is the first part of a 6 part course designed to help with the unique issues of writing for percussion. Each session will concentrate on a different aspect of percussion, and each will have assignments, and on-the-spot writing projects. The composition part of the course will gradually increase, as the course is focussed on composition. Regardless of your interest, background or future, you will need to know about percussion. 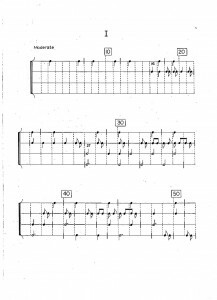 It forms a part of every single outlet of contemporary music making, whether that be concert hall, theatre, jazz or dance music (although here the principles of percussion writing will be of more use than the practicalities). This course aims to explore the language of rhythmic music through experimentation, composition and recording. Some of the assignments will be more relevant to your own needs, some less, but I hope that all will be useful. Each of the six sessions will have a different starting point and should add up to give a 360º look at percussion. I will be writing up the seminars in full form; this brief is just to keep things ticking over so I don’t get too far behind with my writing! Let’s first of all look at the function of percussion in the orchestra. The timpani first appeared in an orchestra in the late 17th century. Early uses were as sound effects, and to give military connotations. 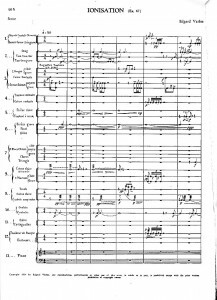 The use of percussion in the orchestra continued to be dominated by war and sound effects until the increasing availability of gongs and better quality cymbals allowed composers to use the white/pink noise aspects of these instruments to highlight cadences and increase tension within the orchestra. 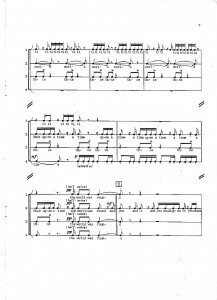 More exotic sound effects proliferated; the use of chains in Schoenberg’s Gurrelieder to represent Gurre’s dead soldiers, anvils in Wagner’s Rheingold, and off stage cowbells in Mahler’s 5th Symphony are all examples of the composers’ urges to add colour and to shape the audiences’ expectations and connotations. The 20th Century saw the floodgates open. The Paris and London Exhibitions had already brought gamelan music from Indonesia, and a limited amount of African drumming, and composers such as Debussy leapt on the new exotica. Ravel had conjured up the sound of Iberia with castanets and tambourines in his orchestral pieces. 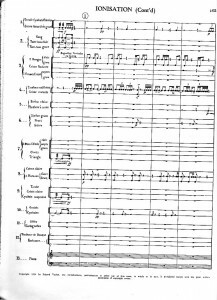 By now percussion in the orchestra was the norm rather than the exception, and the first feature for percussion came in Tcherepnin’s 1st Symphony, where the second movement is given over entirely to untuned percussion (incidentally, one of the symphonies left unfinished at his death in 1977 was entirely for percussion… what a loss…). And then, in 1931 came a watershed moment for percussion writing; Varèse’s Ionisation for 13 percussionists (including a piano). 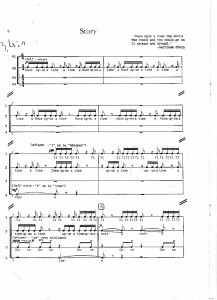 Although the piece ends with specific pitches from piano (playing mostly clusters) coloured by tubular bells and glockenspiel, the majority of the 6 minute piece is for untuned percussion. In the mid 1930s John Cage formed a percussion group with a number of amateur musicians and composer friends, and many of his most important works stem from these times. Now there are a number of percussion only groups around, of which one – ensemblebash – has me as a founding member. You’ll be hearing quite a few tracks of the group over the next 6 weeks. Percussion has gone through a form -> storm -> norm -> perform paradigm. We start with the basics; the sound. Too many contemporary composers treat the percussion section as an exotic toybox. The first question one gets asked is ‘what instruments have you got?’. This brings out a sighing and a rolling of the eyes. I’ve got hundreds, and I don’t want to provide you with a list. Much better to start with what sounds you want, and then try to figure out how you can get that with the instruments at my disposal. I can usually offer alternatives, or work out what might suit your concept… but the idea of writing for an instrument just because it exists doesn’t interest me, nor most other percussionists. As a composer, you will inevitably have to deal with sound effects in some form or another – and often the actual sound effect (door closing, wind whistling, footsteps etc) will not be available to you. Go outside and listen to the sounds around you. Take time. Appreciate the peeling back of the layers of sound you hear. Rather like listening to a single tone for a long while, where the harmonics that make up that tone gradually reveal themselves to you, the details that make up the quotidian will appear. Listen to the primary sounds – the loudest, the most consistent. Listen for the consistent sounds that are hidden behind that sound. Listen for repeated but irregular noises – birdsong, cars, chatter. Then try to peel all that back and listen for the sounds that are lost, hidden behind the everyday. Write a short piece (no more than 2 minutes) reflecting (not imitating) those sounds, but using no instruments whatsoever; or, if you do use an instrument, use it in an unconventional way. Construct sounds. Layer sounds. What can you do if you have to compose and all of your most basic tools are taken away from you? And what have other composers done? Here are two composers who have treated sounds in various ways. Firstly, John Cage’s Quartet. He specifies no instruments at all – the choice is left entirely up to the performers. Notes are notated as stem up or stem down, but he gives no indication as to what this might mean. In this performance (click on the title to play the link) of the first movement by Markus Hauke & the Mainz Percussion Ensemble, the musicians have chosen to interpret longer sounds (minim and longer) as temple bells (small bronze bowls) and the shorter sounds as log drums. 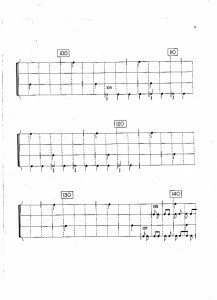 Up stems and down stems are interpreted as high and low notes on the log drums. Finally, an excerpt from the piece that changed the game. Ionisation by Edgar Varèse. 3 bass drums (medium, large, very large), 2 tenor drums, 2 snare drums, tarole (a kind of piccolo snare drum), 2 bongos, tambourine, field drum, crash cymbal, suspended cymbals, 3 tam-tams, gong, 2 anvils, 2 triangles, sleigh bells, cowbell, chimes, glockenspiel, piano, 3 temple blocks, claves, maracas, castanets, whip, güiro, high & low sirens, and a lion’s roar (the score is written in French – I can translate any terms you might wish…). Apologies for the wonky scanning – my score is falling apart. That’s it… next time, timpani. See you there.